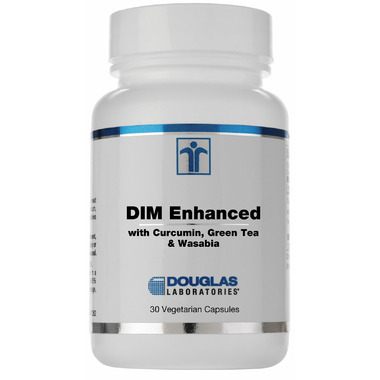 Douglas Laboratories DIM® Enhanced is a microencapsulated form of diindolylmethane, with curcumin, green tea, and wasabia designed to support healthy estrogen hormone balance and immune health. Microencapsulated DIM by BioResponse® is a patented, absorption-enhancing formulation to ensure proper assimilation by the body. Wasabia Japonica - Wasabia, a member of the cruciferous vegetable family, contains long chain isothiocyanates (ITCs). These ITCs are believed to be 10-25 times more potent in the detoxification process than most ITCs found in cruciferous vegetables. 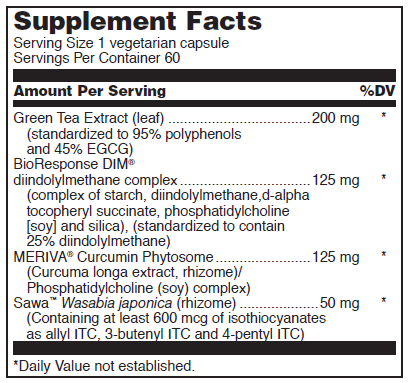 Indications: DIM® Enhanced may be a useful dietary supplement for individuals wishing to support healthy estrogen detoxification, hormone balance and immune support. daily, in divided doses, or as directed by your healthcare professional. Warning: Do not use if you are pregnant, may become pregnant, or lactating. I am taking this supplement to help convert any bad estrogens from taking BC into good estrogen. I have been taking this for approximately 3 1/2 months and I believe it has helped - easier and lighter periods, as well as a reduction in acne. I believe this is a superior formulation to any other DIM out there. This product definitely helped regulate my cycle and hormones. Highly recommend. My Chiropractor actually recommended it to me to begin with. Really impressed with these pills. Noticed a significant change in mood balance. I will keep buying! This product is amazing. My ND had me on it and it works wonders. I only had to take for two months to get the house in order. Very happy to be able to access it here. Excellent quality DIM formula. My doc recommended to me for hormonal regulation and I am quite happy. I will definitely keep buying this.